Blood clotting (thrombosis) is a natural way for the body to stop internal and external bleeding. Without this ability we could not survive - we would have died of internal bleeding. But people hear the word thrombosis rather in terms of disease states where a blood clot (thrombus) occurs pathologically within the blood vessels and threatens the affected organ with a heart attack - clogging the artery with a blood clot. Affected organ is very often heart, but thrombosis is common in the brain, liver, kidneys, limbs and where there is internal damage to the blood vessels, for example due to atherosclerosis or varicose veins . Thrombosis of the arteries of the heart (coronary arteries) and the brain is the focal point of medical prevention because it is the direct cause of the heart attack and heart stroke . 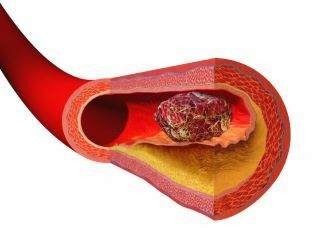 Thrombosis is usually a concomitant phenomenon of atherosclerosis. The body perceives atherosclerosis of the affected artery as damaged and tries to "repair" it by forming a blood clot. When the thrombus grows in size in the affected artery, the blood stream tears it and carries it to the nearest narrowing (usually the bifurcation of the artery), where the thrombus thrombus completely clogs. If this happens in the heart, the result is a myocardial infarction that is accompanied by severe pain. In contrast, the cerebral infarction is completely painless and manifests functional impairment due to the necrosis of the affected part of the brain. In light of the above-mentioned dangers, it is understandable that doctors try to prevent thrombosis in susceptible patients. In practice, it is such that the affliction (eg, cardiac disease with already developed atherosclerosis ) permanently takes medications that disrupt or slow down the blood coagulation - have anticoagulant effects . By this, the balance between growth and re-dissolution of the thrombi in the affected arteries moves towards dissolution and the risk of heart attack decreases. In this way, warfarin and aspirin are often used against thrombosis. Warfarin is a typical Paracelsus medicine, ie an anticoagulant, which is used as a drug in microscopic doses . Aspirin is also well known to "thin the blood" and, in addition, in a heart attack, it limits cell damage by its pronounced anti-inflammatory action . However, warfarin and aspirin do not meet the definition of adaptogen. It appears that antithrombotic and protective agents are also found among adaptogens, and that in risk patients long-term treatment with Paracelsus anticoagulants can be equally replaced by the use of herbs and herbal mixtures that often contribute to the overall long-term health of the patient. It turns out that the model adaptogen, which is ginseng , has its own anticoagulant effects and is part of the herbal mixtures traditionally prescribed in the cardiac TCP. A related ginseng notoginseng , which does not have mental activation and stimulation effects, is even more beneficial for the cardiovascular system. Purified and standardized panaxoside blends are even injected in Taiwan and China as a relief for acute heart stroke . Arachidonate thrombosis : Compared to aspirin (IC 50 = 63μM), ginsenosides Rk 1 and Rg 5 8-22 times more strongly. Ginsenosides Rg 6 , F4 and Rk 3 have an IC50 of 76 μM, 114 μM and 128 μM, respectively - only 1.5 times up to twice as strong as aspirin. Thrombosis via thromboxane: Ginsenosides Rg 6 , F4, Rk 3 and Rh 4 act against thrombosis with an IC 50 of 286μM, 87μM, 187μM and 119μM, ie 2-4 times more potent than aspirin (IC 50 = 468μM). Collagen tracheal thrombosis : Investigated ginsenosides do not act on this path. Thus, we see that, according to the above mentioned studies, ginsenosides Rk 1 and Rg 5 act against thrombosis 10-20 times more strongly than aspirin . In contrast, ginsenoside Rg 3 (both S and R epimer) and acetylated forms of potent panaxosides (ginsenoside acetyl Rs 3 , gssd, acetyl Rs 4 and gssd acetyl R 5 5 ) were found to be ineffective . The antithrombotic effect of ginseng and drugs containing such effective panaxosides can thus be considered scientifically proven. Traditional Chinese medicine against thrombosis commonly prescribes the standard herbal blend Xiao Shuan Tong Luo (Chuan Xiong - rhizoma chuanxiong 120g, Dan Shen - radix salviae miltiorrhizae 90g, Huang Qi - radix astragali 180g, Ze Xie - rhizoma alismatis 60g, San Qi - radix notoginseng 60g, Huai Hua - flos sophorae immaturus 30g, Mu Xiang - radix aucklandiae 30g). The Zhao2015aee study confirmed the effect of this mixture (Xiao Shuan Tong Luo) against arterial and venous thrombosis.